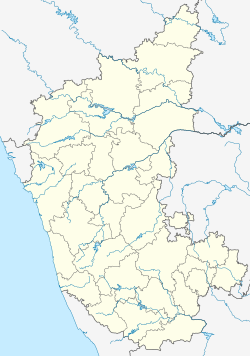 Hoskote (historically known as Ooscota or Ooscata) is a taluk in Bangalore Rural District, India. Headquartered at the Hosakote town, it consists of five hoblis - Anugondanahalli, Jadigenahalli, Kasaba, Nandagudi and Sulibele. Hoskote was Jagir part of Graet Maratha warior Shahaji Raje Aprox 50 years and also part of Swarajya of chhateapati shivaji maharaj. Site of the Battle of Ooscata in the First British-Mysore War, on the night of 22-23 August 1768. As of 2011[update] India census, Hoskote had a population of 56980. Males constitute 52% of the population and females 48%. Hoskote has an average literacy rate of 86.22%, higher than the state average of 75.36%: male literacy is 89.58%, and female literacy is 82.68%. Hoskote has 11.98% of its population under 6 years of age. Wikimedia Commons has media related to Hoskote Lake. ^ "Census of India 2011: Data from the 2011 Census, including cities, villages and towns (Provisional)". Census Commission of India. Archived from the original on 2004-06-16. Retrieved 2008-11-01.